Rendering of proposed open space in Studio Plaza. Tomorrow, come out to the Silver Spring Civic Building at 7pm for an informational meeting on Studio Plaza, a substantial development proposed for Fenton Village. Located on Thayer Avenue between Fenton Street and Mayor Lane, Studio Plaza will eventually include over 600,000 square feet of housing, offices, shops and restaurants, a hotel and a 1/3-acre public park. Monday's meeting will discuss the project's first phase, which includes 415 apartments, 10,000 square feet of retail, and an underground garage to replace the parking lot currently on the site today. Could this happen in Silver Spring? Photo by M.V. Jantzen on Flickr. 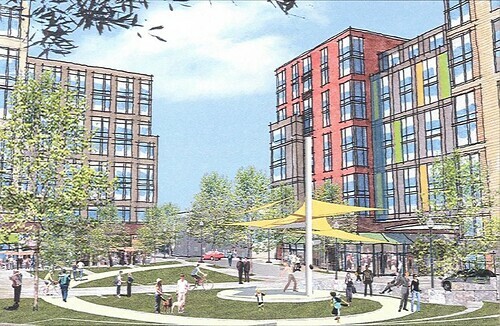 Studio Plaza was first proposed in 2006 as a much smaller project along Thayer Avenue; in 2009, developer Bill Hillerson approached the county about redeveloping the adjacent Public Parking Lot 3. By combining the properties, Hillerson could not only create a larger project but build two new through-streets and a public park. The current iteration of Studio Plaza, now covering five acres, was approved by the Planning Board in 2009. A one-story building on Thayer were demolished in 2010 and the site has been empty ever since. I've written before that the project will continue the revival of downtown Silver Spring, injecting Fenton Village with new residents, businesses and open space. I'm particularly excited by the new streets, one of which will be for pedestrians only. They're narrow and will be lined with shops, giving Studio Plaza the chance to create an intimate urban space similar to Bethesda Lane in downtown Bethesda. Check out the full meeting announcement with more details about the project. The meeting's at 7pm at the Civic Building, located at Ellsworth Drive and Fenton Street. Gingold at last year's Flower Avenue Holiday Market. - If you're tired of your current yarn, Sarah Gingold has a solution for you. 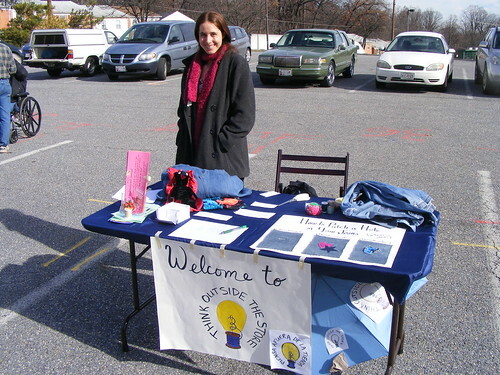 The proprietor of Think Outside the Store, a "wearable art studio" located in downtown Silver Spring, will host a Yarn Swap July 21 from 12 to 3pm at the studio, located at 816 Thayer Ave. Think Outside the Store currently holds workshops on sewing and jewelry making, but they're expanding into what Gingold calls the "yarn arts," like knitting and crocheting. For $5 (or free with a donation of knitting needles or other tools), you'll be able to donate or pick up as much yarn as you like, while yarn artist Amina Ahmad will be there to show all the cool things you can do with leftover yarn. - Finally: Do you need friends? So did Peng Wu, a busy lawyer living just across the D.C. line who wanted to meet people outside of work. That's why he started Hang Out DC, a social network for those who want to "make friends without benefits." 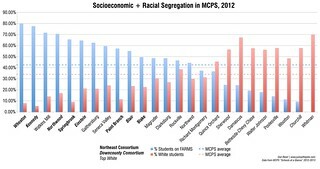 "DC is such a transitory city," writes Peng in an e-mail to JUTP. I hope that a platform that helps people connect face-to-face and make friends . . . would be well-received." Hang Out DC already has 200 members and is set to launch this summer. Check out their website (linked above) or you can visit them on Twitter. You have a great photo captioned "Could this happen in Silver Spring?" The answer is no! It couldn't be built because the opponents of bridges over streets would rise up against it, just as they did for the handicapped access bridge from the Wayne Avenue Garage to the new Silver Spring Library. I believe the street pictured is private, and the "bridge" is actually apartments, so it's not like anyone's using it to cross the street. This is totally different from the bridge over Wayne Avenue. 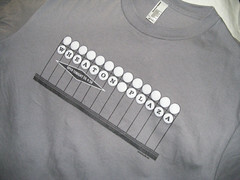 Personally, I'm conflicted about the Bethesda Lane "bridge." 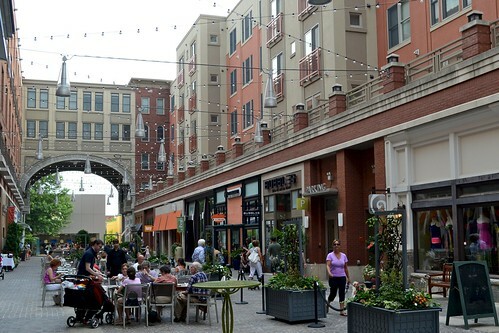 The street feels as nice as it does because there's a sense of "enclosure," making it feel more like an outdoor room or a courtyard, but I think the bridges eliminate an opportunity to see out into the rest of downtown Bethesda, particularly the skyline to the north. Either way, the point of the photo was to show a narrow pedestrian street, which IS what Hillerson has proposed for Studio Plaza. Good info! I'm hoping Studio Plaza bring more retail/shopping to the area in turn bringing more pedestrians/people to the area. Hopefully in result of this, we'll see the sidewalks widened and bike lanes added for a more pedestrian friendly city. I would never want us to be anything like cookie cutter Bethesda. But I'll happily take more shopping any day! Dan, not sure if you know, but your blog's new format doesn't display well at all on iPad. Rather than trying to explain, look at it yourself and you'll see it's virtually impossible to scroll past the viewable page and other maladies. The desktop/notebook (standard) version isn't the easiest either but at least one can navigate around it. Sorry about that, David. When I put up the new template last month, I looked at it on an iPad and it worked fine at the time, but right now I'm having the same problem you are. I'm on it! Okay, this isn't a total solution, but try this: at the top left corner below where it says "magazine," click on it and a drop-down menu will appear. Select either "Sidebar" or "Timeslide." The page will change again, but you should be able to read posts and scroll down. Did you or anyone you know go to the meeting? I'm curious what the latest version of the plan is and if they have any timetable for construction.